Here at Cecil Amey we are always keen to support any initiatives in the industry, and are delighted to be involved in the National Love Your Lenses campaign. 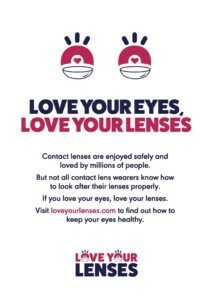 This campaign encourages users to look after their lenses correctly and outline the common do’s & don’ts ! If the answer to any of these questions is no, leave your lenses off and consult your optician immediately.